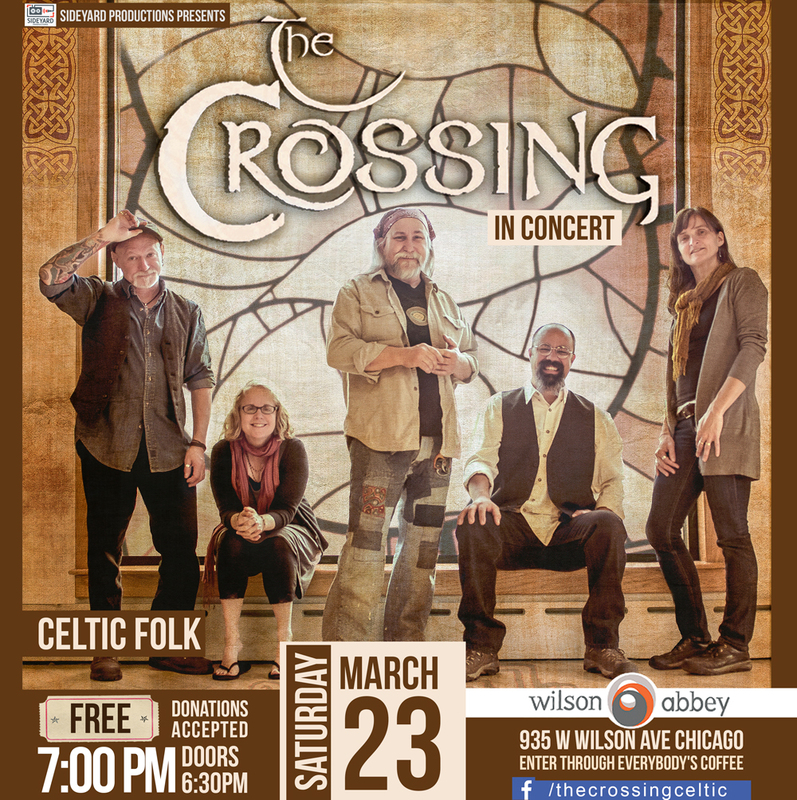 Come out to Wilson Abbey on Saturday, March 23 for Chicago’s own celtic folk group The Crossing! This will be a free show for all ages to get jiggy with it, so bring the whole family. Enter through Everybody’s Coffee. The Crossing has been performing a mix of traditional celtic and original songs and tunes since 1984. Though all members but one are natives of the U.S. (Hilde the cellist is from Norway), their roots are in the celtic lands and their original songs mirror those traditions. In their set can be heard tales of joy, accounts of hardship and victory, celtic prayers and psalms set to music, and the ever-present danceable jigs and reels. The band’s members reside in inner-city Chicago, in the highly diverse Uptown neighborhood. Part of a group that works closely with the region’s poor and homeless gives unique perspective on both the pleasures and struggles of daily life. Spiritual themes are woven throughout their sets and the overall mood is one of hope, joy and celebration that appeals to people of all convictions. The instrumentation at a Crossing show is engagingly diverse. Most members are accomplished at not only one, but several instruments. Tony, the group’s front man and main songwriter, is at home with guitar, bouzouki, banjo, bagpipes and whistles, in addition to his comforting and seasoned voice. Mark, the band’s “fluter,” also beautifully plucks the harp. Hilde’s main calling is cello, which provides a great low-end to rhythms and melodies, but she also fills out the sound with piano, guitar, and contributes lead vocals. Jennifer focuses all her energies on being the fiddler extraordinaire, and Eric is another jack-of-all-trades with melody guitar, bouzouki, bodhran, and djembe. All members sing harmonies, which makes for a transcendent experience when combined.